Beveled Top Load Frames are changeable wall poster display frames and signage frames that allow you to drop your poster from the top or slide-in from the side. 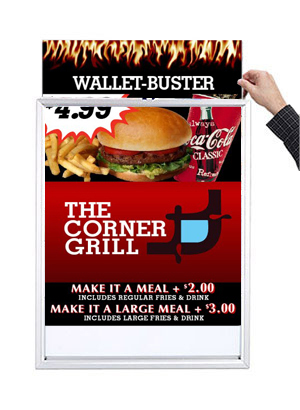 This 1” aluminum wide frame with its narrow 5/8” profile hugs the wall and is designed with a hidden slot to let you quickly change your posters, signs, advertising or other announcements. You don’t have to take this display frame off the wall. Top Load Frames are the simplest and most cost effective quick change poster display frames available anywhere and come in popular black, silver and gold finishes. Beveled Top Load Frames accept posters and signs mounted to boards up to 1/4” thick or thin poster sheets. Backing board and protective clear overlay are available as options. Euro-Style Top / Side Load Frames are changeable display frames with a narrow 3/4” off the wall depth. The attractive flat 1 1/8” metal profile face comes in popular anodized brushed silver and brushed black frame finishes. The overall poster and sign frame design presents a clean, contemporary "Euro" style look. A removable top or side frame rail allows you to fill and close the frame slot gap. 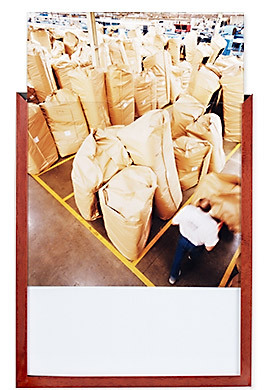 Euro-Style Top Load Frames accept thin printed sheets or mounted posters and signs up to 1/2” thick. The aluminum Top Load display frame is ideal as a wall poster display or sign frame that can mount to any flat surface or a point of purchase display. Small sign frame sizes as well as large frame and custom frame sizes are available. Wood Top Load Frame should be considered when a wood sign display or wood poster display frame is an important part of your interior décor fixture requirements. With its narrow depth and contemporary 1 3/16" wide flat face profile, Wood Top Load Poster Frames present an attractive custom picture frame style for changeable sign holders or poster display frames. And with ten popular stained wood finishes available, finding the right display sign holder finish that works with your advertising and signage as well as your interior décor, just got easier. This high quality, wood poster holder and sign display frame, is an ideal choice for retail stores, corporate offices, healthcare facilities, financial institutions, government agencies, and other interior environments. Wood Top Load Frame’s narrow wall depth makes it a popular hotel lobby poster display and elevator frame. SwingFrame Manufacturing is a division Access Display Group, Inc., located on Long Island, New York. Since 1992, SwingFrame, a USA manufacturing company, has been designing, fabricating and distributing a wide range of easy change Display Frames, Display Cases and Display Fixtures to architects, designers and purchasing agents for their visual merchandising and visual communications projects and display fixture needs. Many of the displays, including SwingFrame’s patented swing-open display frames such as the wall-mounted poster display frames, sign holder frames and free standing poster displays have been purchased by thousands of companies; retail stores, corporations, institutions, government agencies and military facilities –all industries and markets. Poster Display Frames, Sign Frames and Signage Poster Holder Stands can be purchased by calling SwingFrame Mfg. at 800-289-1539 or directly online at our sister division www.displays4sale.com This website was created to provide the finest selection of changeable frames and display fixtures to fit your to fit with your display frame requirements and budget. Though this secure e-commerce website, all SwingFrame display products can be purchased including swing-open poster displays enclosed display cases, and non-swing wall and floor display fixtures. One of the most popular poster display frames that meet those changeable frame requirements and work well with tight budgets is our wall-mounted Top Load Frames. These quick change Top Load Display Frames and Side Load Display Frames come in numerous standard and custom sign frame and poster frame sizes including; 11 x 17 frame, 12 x 18 frame, 13 x 19 frame, 22 x 28 frame, 24 x 36 frame, 27 x 40 frame sizes. 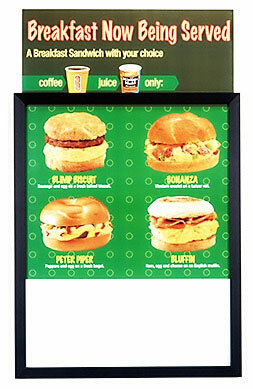 These are a few of the popular wall top load poster display and sign frame sizes offered. Large custom poster displays from 40 x 60 frame size, up to 48x96 frame sizes are also available. Each metal and wood top load frame has it own unique profile and quick change design features and price points. All Top Load Frame come in silver and black poster frame models. These Top/Side Load Frames, poster holders and numerous other wall poster displays, sign holders and floor standing poster display fixtures can be purchased directly and securely online at Displays4Sale.com.